Like many AFOLs I seem to spend an inordinate amount of my time sorting and resorting my LEGO collection, and it was during a recent sortfest that I stumbled across the little fellow below. It reminded me that I'd long intended to share the rambling tale of how he came into my possession, and in so doing say a public "thank you" to the US-based AFOL and all-round good guy who has tracked down all manner of US-exclusive LEGO-related items for me over the years including Yoda. 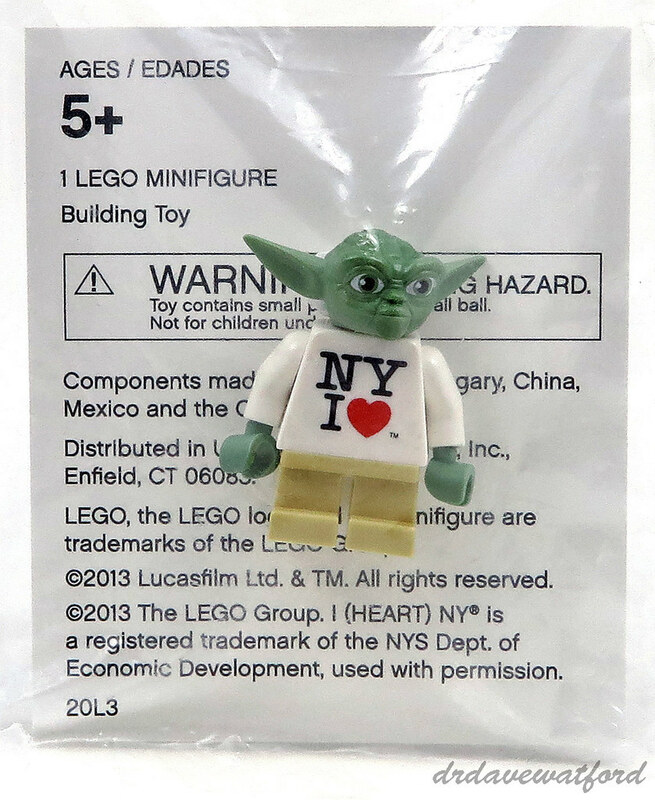 To further promote the Yoda Chronicles series, the nearby Times Square branch of Toys R Us ran a promotion from May 23rd to 25th 2013 whereby purchasers of specially-marked copies of Set 9493 would receive a limited edition "NY I Love" Yoda minifigure. Apparently 1,000 of these minifigs were made and handed out during the 3-day promotion, and as a big Star Wars fan and LEGO collector I was obviously really keen to get hold of one. Thankfully, help was at hand in the form of US-based Brickset admin Roland a.k.a. Rocao, and to cut a very long story short he was able to secure a limited edition Yoda minifigure for me. The plan was initially for Roland to package Yoda up with a bunch of other items that he had collected together for me and for other folks and ship the whole lot over to the UK for me to distribute. For various reasons, however, Yoda didn't make it into the consignment and was left stranded in the US. 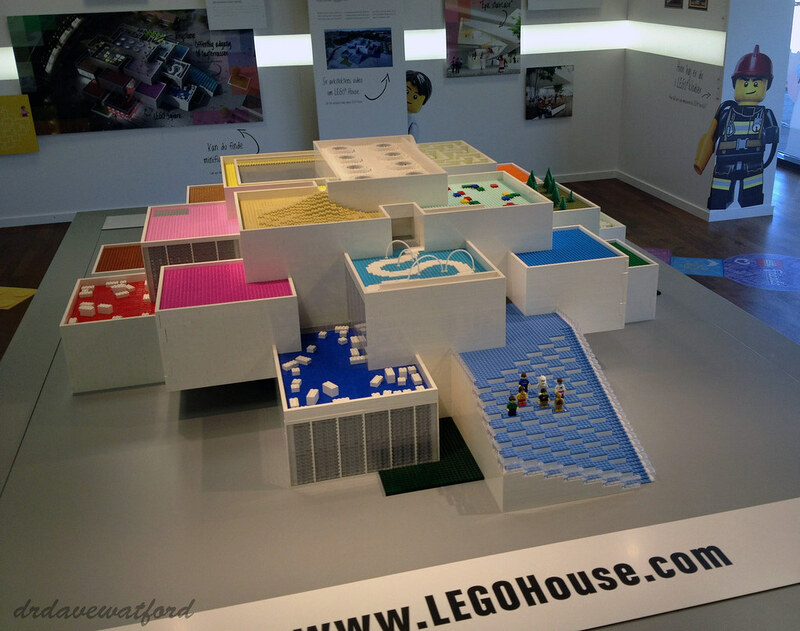 Jumping forward a couple of years to August 2015, a delegation of Brickset Forum members headed by Brickset head honcho Huw and myself journeyed to the LEGO mothership in Billund, Denmark. Thirty three of us in total travelled over at the invitation of LEGO's Community, Events and Engagement Team for a one-day visit which included a tour of the fabled vault housing copies of pretty much every LEGO retail set every released, the LEGO factory at Kornmarken, and the site of the work-in-progress LEGO House and visitor centre (above). There was also a visit to the LEGO employee store for a spot of shopping, and a presentation by LEGO designer Mike Psiaki who's the man behind 10248 Ferrari F40 amongst other sets. As good fortune would have it, one of the 33 Bricksetters to make the trip to Billund was Roland, who travelled over to Denmark from California. Aside from the fact that it was absolutely brilliant to finally get to meet him in person and hang out after literally years of chatting online, Roland had stashed the promised Yoda minifig in his luggage and so I was finally able to take delivery. Neither Yoda's printed sand green head, which has a tuft of white hair at the rear, nor his short tan legs, are exclusive to this minifigure, although the head has only appeared in two other sets, 75002 AT-RT and a Yoda Clone Wars Watch Set. The torso, which doesn't have a back print, isn't exclusive to this minifigure either, having also appeared as a part of a 2013 New York Toy Fair giveaway. The minifig came sealed in a 7.5 cm x 13.5 cm soft plastic bag which also contained the printed white card that you can see in the picture above. In addition to Yoda, Roland had also brought me the special cardboard sleeve which was placed around the otherwise standard copies of 9493 X-wing Starfighter to mark them out as being promotional items. 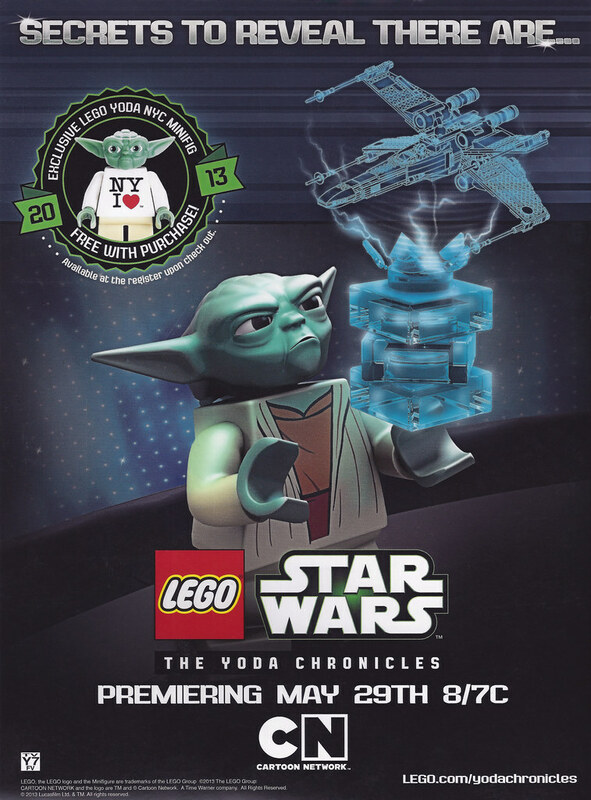 The front of the sleeve (above) is focused on advertising the Yoda Chronicles premiere and also gives notice of the free Yoda minifig available with purchases of the set, while the back of the sleeve (below) provides photographs of the life-sized LEGO X-wing together with technical drawings and some facts and figures. 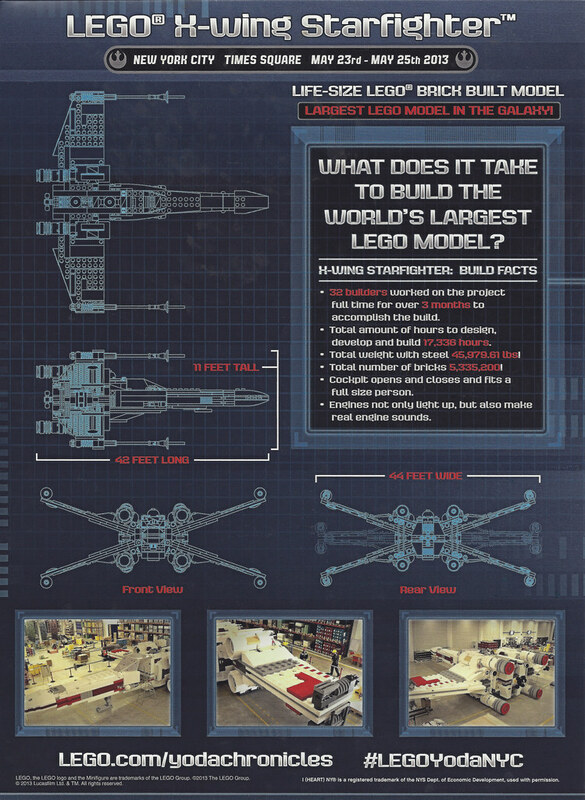 Talking of the X-wing, following its brief Times Square residency it was transported to LEGOLAND California in June 2013 where it went on show. Then, in March 2015, the X-wing crossed the Atlantic to LEGOLAND Billund where it formed the centerpiece of a Star Wars display. And so it was that by a quirk of fate the X-wing was on display at LEGOLAND Billund when I visited, and my Yoda minifigure was therefore, in a manner of speaking, reunited with the X-wing more than 2 years after the Times Square reveal. 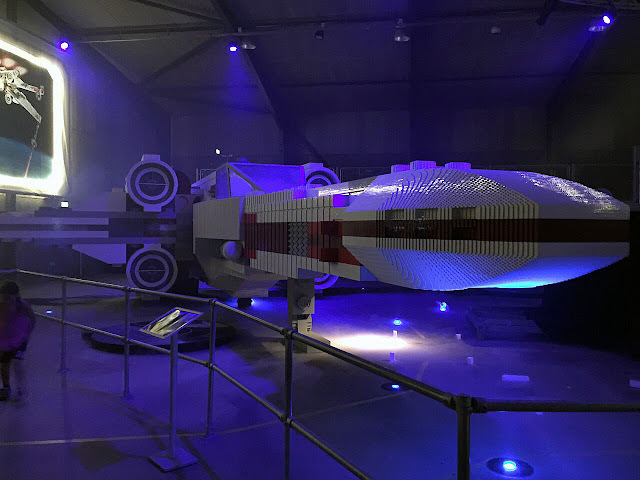 All of my pictures of the X-wing unfortunately came out appallingly badly, so I'm indebted to another US-based Bricksetter who came on the Billund trip, JusJeff from Iowa, for giving me permission (albeit about 18 months ago....) to use his picture below. Are you still attempting to collect one of every single Star Wars Lego set Dave? When I see the dozens of special releases they do, I always wonder if you are trying to chase them down? Good question.... My approach remains consistent with a previous Star Wars-related Gimme LEGO posting from back in 2012 (goo.gl/n8k4bX) - I'm continuing to stay up to date with all the Star Wars retail releases but don't lose sleep over the the promo stuff and only pick it up if I can get it at a price I think is vaguely reasonable. Cool thanks for answering - you must have a massive number of unopened sets I guess! My career and having 3 kids has taken over the last few years so I've got most of my stuff in storage, and keep buying for a rainy day, and have 117 unopened sets now.